A drum is a heartbeat. It is a living creation, it is a therapeutic tool, it is one of the basest of instruments connected to what it is to be alive. Almost every culture has their own type of drum, and with that drum comes specific meaning and purpose. The drums that I create or paint vary widely in style, but their purpose is the same. 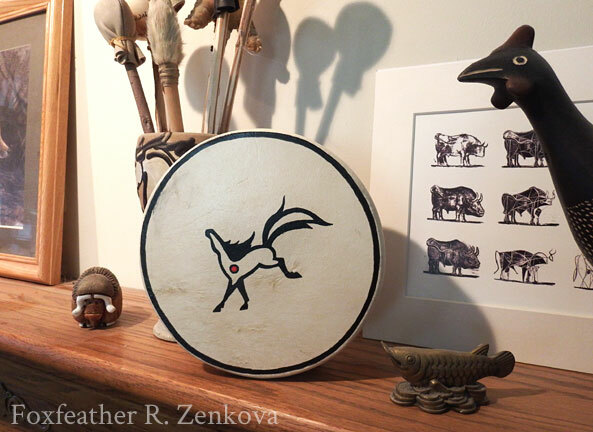 A drum is a symbol for life, for the rythms that keep every living thing going. These drums are completely hand crafted and made with natural materials. Each drum is unique, each has its own voice. Each of these drums is perfect for meditation, music making, and display. They have been specially sealed so they are fully playable even when painted. Contact us to find the drum that is just right for you! Please note that production time can take 1-3 weeks depending on size and material availability. I try to keep most of my drum sizes in stock but each one is painted to order and sometimes a certain size needs to be made from scratch. If you need the drum right away, or want to know a more exact shipping date, please email me! Please inquire about custom painting prices or larger drum sizes! Click on the link above to see available glyph images! Size listed is the diameter of the drum, measured from edge to edge. Each is handmade so sizes vary slightly within the range. Every drum comes with a free double-sided (leather and sueded leather) beater (drumstick)! Top-painted and specially laced mural-sided pow-wow drums and stands are available by custom order. These magnificent drums have a deep, booming voice and are built to last a lifetime. Click here to inquire about custom pricing for pow-wow drums! Whether used for ceremony or as a special wall hanging, these hand-made, hand-painted drums bring their unique spirit with wherever they go. The designs are specially protected, making the drums fully playable. Each of these drums is one-of-a-kind and signed by the artist.